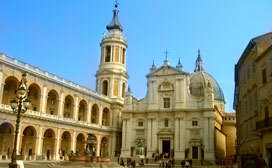 Loreto is a place linked to the most profound Christian religiosity, because it is home, inside the Basilica, to a construction that more and more evidence confirms to be the Holy House, which is the house where the Virgin Mary lived. It was transported from Palestine by a family called Angeli, at the time of the Crusades. 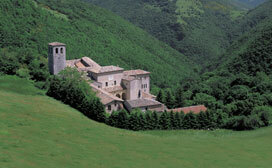 The Monastery of Fonte Avellana is located on the forested slopes of Mount Catria. Place of great peace and mystical charm, well worth a visit. The "Scriptorium" is the most significant section of Fonte Avellana. Here, the monks were engaged in the transcription of ancient texts on parchment, creating precious illuminated manuscripts. The Monastery of Fonte Avellana is perfectly preserved, as it has never been damaged by bombings or earthquakes. Distance from Mondavio: about 40 km.